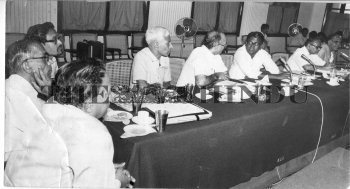 Caption : The Central study team on drought led by Mr. B.K.Thaimni (5th from left) seen having discussion with Karnataka Revenue Minister Mr. A.Lakshmisagar (6th from left) as Mr. R.L.Jalappa (partly seen), Minister for Cooperation, Finance Minister, Mr. S.R.Bommai (2nd from right) and Mr. Abdul Nazir Sab (extreme right), Minister for Rural Development and Panchayat Raj in Bangalore, the Capital of the southern Indian State of Karnataka. Also seen are team members from left: Mr. N.K.Chopra, Deputy Commissioner, Ministry of Agriculture, Mr. N.K.Dikshit, Joint Advisor, Planning Commission, Mr. M.M.Datta, Dy. Advisor, (PHE), Ministry of Works and Housing and Mr. K.Keshaviah, Superintending Engineer, Ministry of Transport (Roads). 1984-10-12.